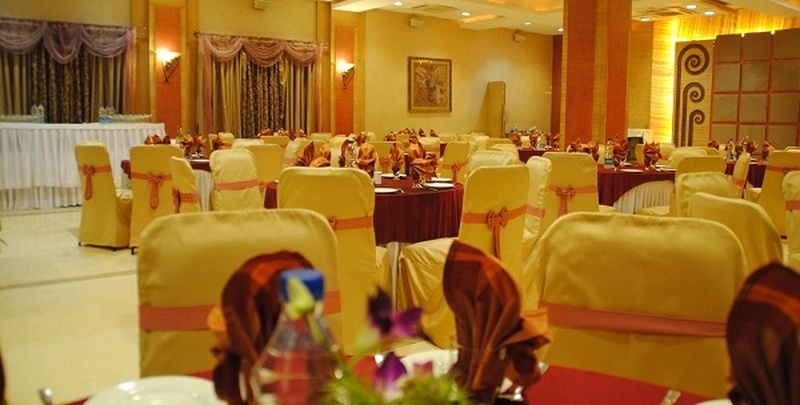 Goldfinch, Mumbai is a gorgeous banquet hall in Andheri and has one of the best banquet halls in Mumbai. The lavish 4-star hotel is in the prime location of Andheri East and has multiple party areas that you can browse through to find the perfect one for your big day. The perfect location of the venue makes it easily accessible by road, metro and trains. The venue offers six beautiful banquet halls of varying capacities to suit every pre-wedding, wedding or corporate requirement. The elegant 3,000 sq. ft. banquet hall - Bay Leaf can host a large wedding or reception. The pillared space has understated décor in earthy tones and can be decorated to suit a wedding or a conference. This banquet hall in Andheri also has a gorgeous terrace on the 8th floor, that is perfect for wedding receptions. It has an upper and lower deck, a sparkling pool and a lush garden area. The rooftop at Goldfinch is just as good for a cocktail party at sunset.